I read an article from a fellow teacher blogger today that is too important not to share. It’s from Chrissie at The Undercover Classroom and you SHOULD click here to read it. As teachers, we know that this over-emphasis on state testing has brought more harm than good to our classrooms. My teacher friends and I talk about it and I vote and contact my state reps all the time. I’m not kidding when I say that I have them both on speed dial. But I truly feel helpless. Perhaps that’s why Chrissie’s post resonated with me. Chrissie is doing something about it. She’s opting her child out of state testing. The post is great. She explains how our testing culture is bad for students. And it is. I especially liked #6 on her list, on how professional development has changed since testing has taken over the classroom. How have I not considered this? YES! Teachers across the nation are spending more time during PD learning to analyze testing data and prep kids for the test and less time improving their skills as educators. And to Chrissie, I just want to say THANK YOU. Thank you for standing up for your daughter so that she doesn’t have to spend 16 hours taking a test. And thank you for being brave and speaking up about this testing craziness! 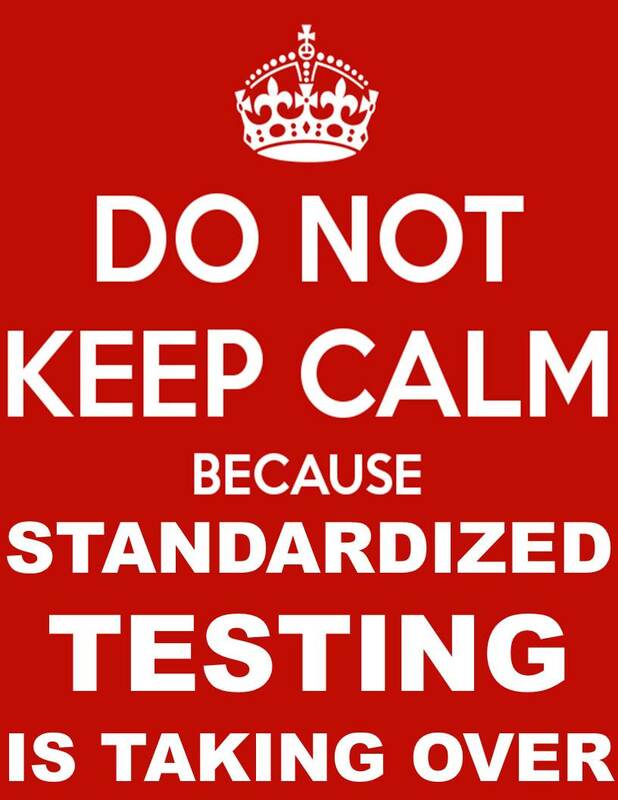 PS–Chrissie isn’t the only one blogging about how teachers are responding to the testing madness. Sallie Borrink wrote a super important post that you SHOULD read too. Many teacher-parents are leaving the classroom altogether to homeschool their own children. Are teachers who become homeschoolers the indicator species we should be watching? I think so. As part of our Earth science unit we spent some time this last six weeks learning about the different types of alternative energy. Since this is my first year teaching 5th grade science, it had been a long time since I heard the word geothermal! Students spent some time defining and drawing each type of energy and we made an anchor chart to show what we were learning. 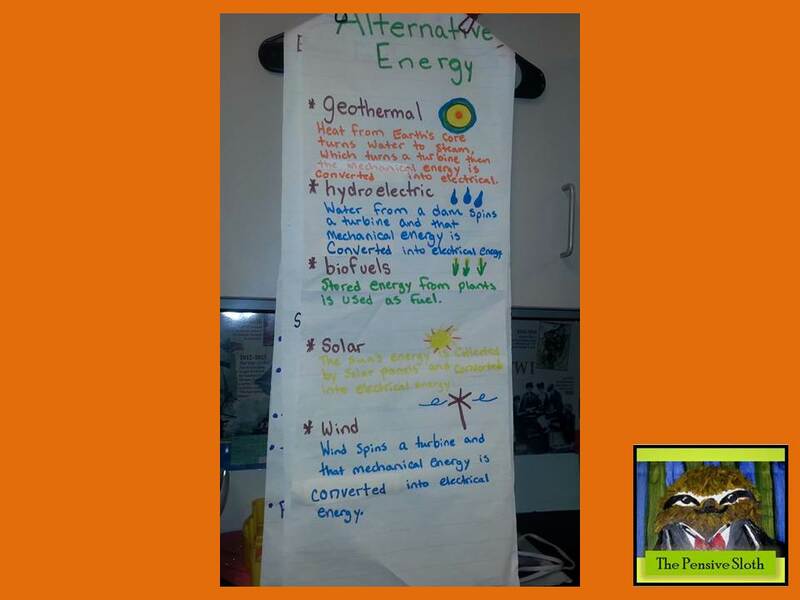 Anchor chart for different types of alternative energy. (geothermal, hydroelectric, solar, wind, biofuel/biomass) HINT: Don’t write in yellow! Write in black and trace over in yellow! We also spent some time learning about how coal was formed deep in the Earth. 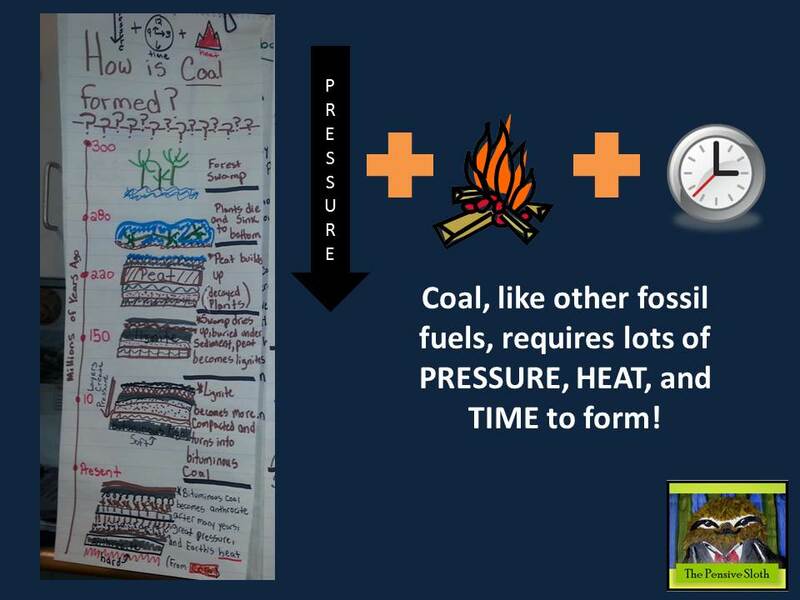 Anchor chart and slide showing formation of coal. Now, as we prepare for our STAAR test in April, we will be reviewing vocabulary associated with coal formation and alternative energy. I’ve put together a quick vocabulary review activity for my kiddos that involves cutting, pasting, and matching the words to the definitions and then symbolizing each term. Vocabulary Snip-it! 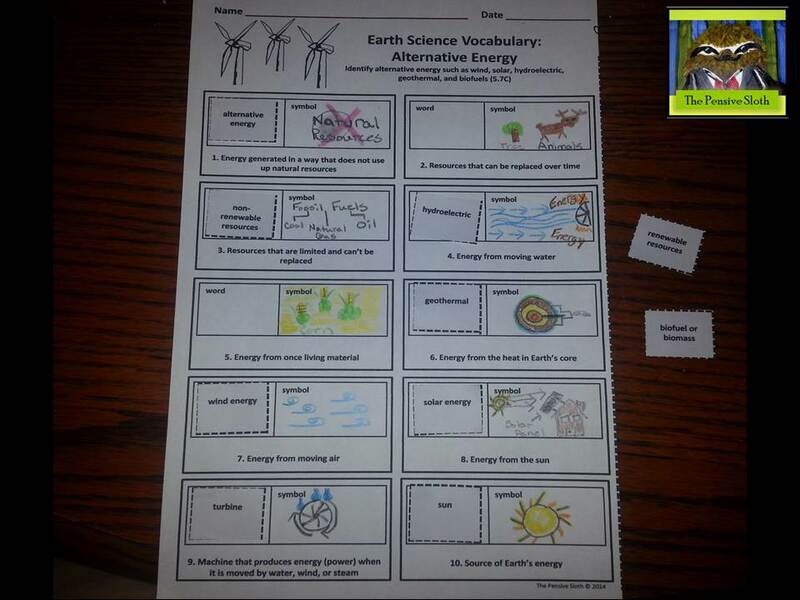 worksheet to review alternative energy. Click below to download the freebie! 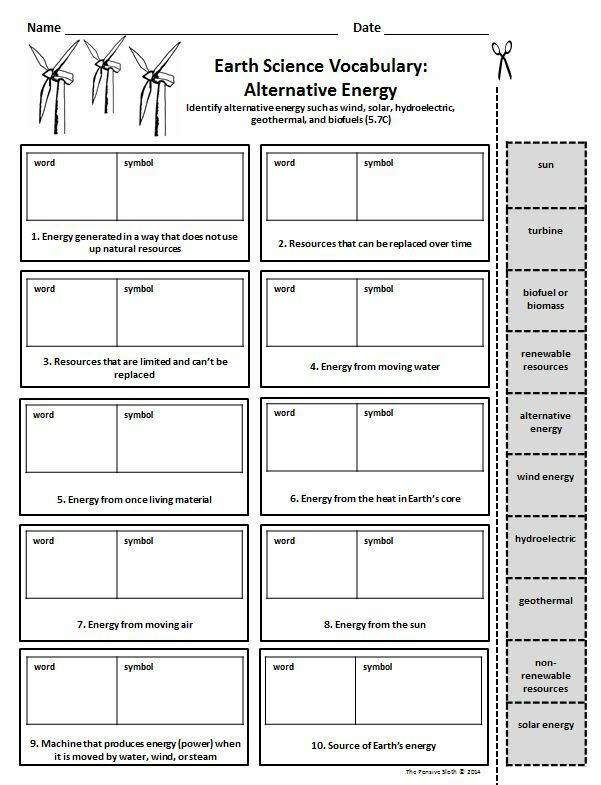 You can download a PDF of this Alternative Energy Worksheet or get the Earth Science Vocabulary Snip-its! pack for $1.00 at my TPT store. The pack contains 4 pages of vocabulary including sedimentary rocks and fossil fuels, fossils, landforms, and alternative energy. Thanks for stopping by and happy teaching! Here is the almost finished product! Students match vocabulary terms and symbolize or illustrate each word. Great review activity for 5th grade science STAAR test! OK, so if you live in Texas or another state with a big test…basically anywhere in the US…you know the challenge that anchor charts present. I love anchor charts! My students use them. I don’t spend a ton of time making them pretty, but rather focus on making them meaningful for my kiddos because we create them together. My challenge is where to put them? I am self-contained, so I have anchor charts everywhere about everything. Other than anchor chart overload and running out of space, when the big test comes it all has to come down or be covered. I am trying something new this year. I bought a few command hooks, some colorful dollar store clips, and grabbed a few plastic hangers and voila! My anchor charts are now removable. I could only get back far enough to see part of the wall where they are hanging, so I’m sorry about the picture. I’ll work on getting a better one up soon. Actually, they are hanging on cabinets above student lockers. It’s not perfect, but it should help significantly with hiding all of the learning and help before the big test! STEP 1–Write fraction standards on chart paper, set class goals, and plan a class celebration. Our class decided on 85% for each assessment as our goal and that we would celebrate with a picnic outside on a nice weather day when we met our goal. STEP 2–Review each skill with a mini-lesson, have students complete a few ‘number problems’ to make sure they understand, then give partner time to work some word problems while meeting with a small group who needs a little extra help. Number problems are simply working with the numbers. I need to know that my students understand equivalent fractions with mixed numbers and improper fractions prior to giving them lots of word problems to solve! Check out CC Sheets. It is one of my favorites for number only problems. Because I teach the TEKS and not CC, I search by skill rather than standard and grade level. STEP 3– Assess and report class averages on the chart. The kids love to see their progress posted in the classroom. This year’s Fraction Boot Camp was a big success! Our class averages were in the 90s each time and we got to celebrate with a picnic outside. We also played some fraction games and you can find those here! There is a winter set, Valentine’s Day set, and St. Patrick’s Day shamrock set. St. Patrick’s Day/Shamrock Theme Game–Students sort fractions by finding equivalent fractions and matching them to the simplified (or reduced) fraction. 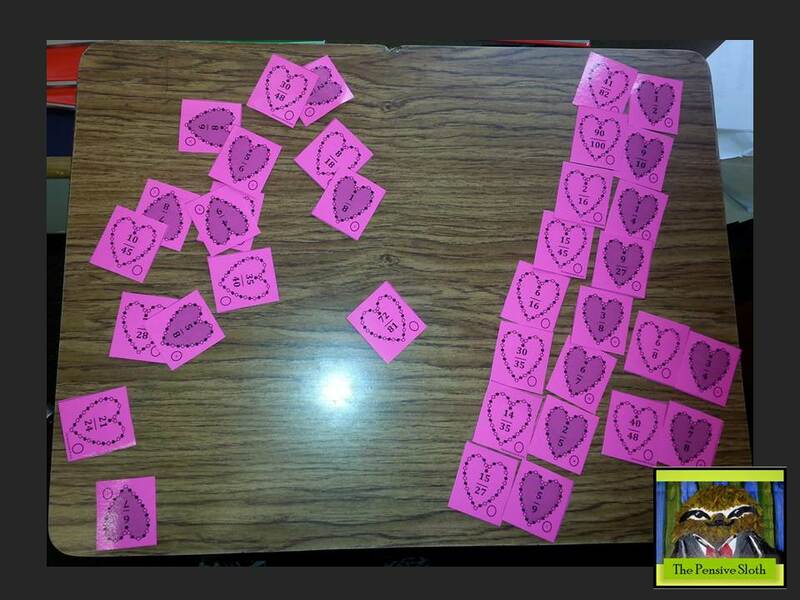 Fun heart themed fractions games to help students practice matching equivalent fractions, including improper fractions and mixed numbers. Fun winter-themed game for students to practice equivalent fractions, including improper fractions and mixed numbers!